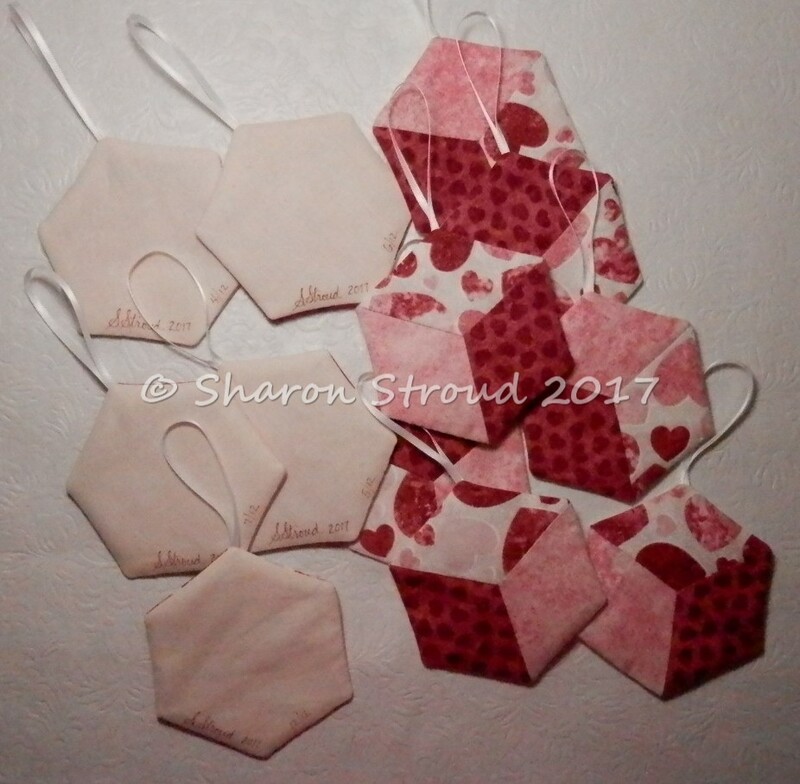 Today was spent finishing the tumbler top, trimming the large hexie top, and adding borders to the small hexies. And then I hand basted all three. A very satisfactory day! Yes, that's right.... For a person who hates Halloween and trick or treating (yes, even as a kid), I have a fairly large collection of Halloween fabrics and quilts! I think it's the novelty (!) of the fabrics HEHEHE! 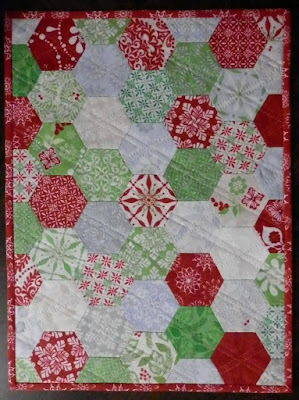 This is another hand pieced top. If you look closely, you may be able to see the flowers formed by the coffins. Some are full flowers and some are partially hidden behind others. It looks totally different when viewed horizontally. I decided to machine quilt this one. We'll just say it was a learning experience. Where to start and stop the quilting to make the flowers more defined, especially the ones that were underneath others. What to do about the green leaves? 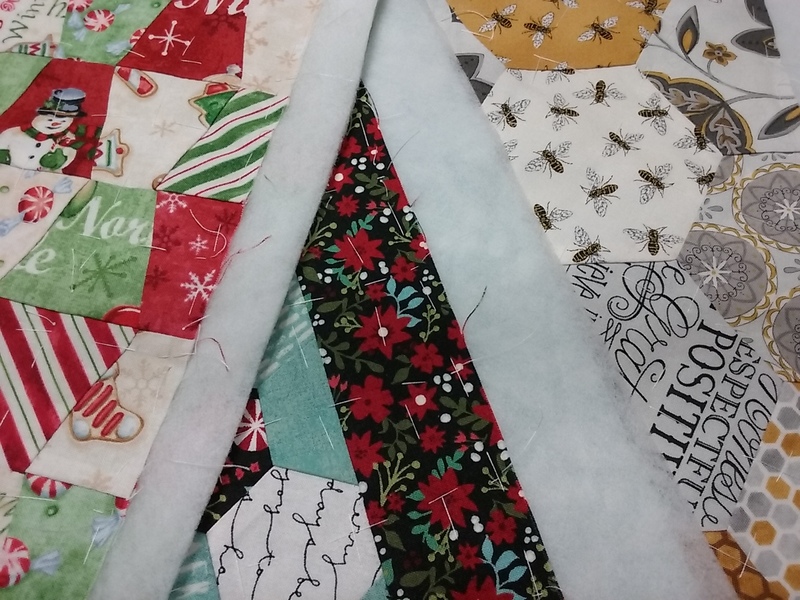 But I persevered and finished the quilting and got the binding machine sewn on in an afternoon. 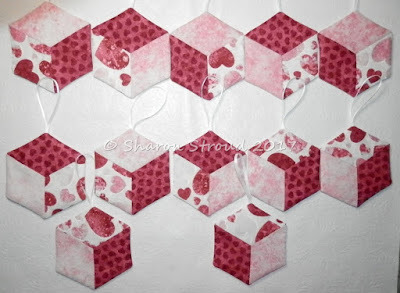 The backing was pieced from fabric samples I had in my stash. I love the Halloween-but-different-era-vibe compared to the fabrics on the front. I tied knots and buried the thread ends. In my next life I am going to be a better photographer LOL. 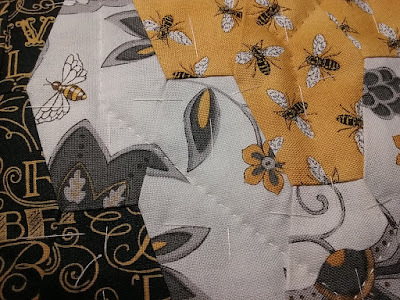 I did finish quilting the Bee quilt and will show it once I get the binding on. It is quite fetching, if I do say so myself. Hope you are all surviving this weather. So crazy. I've spent most of the day hand quilting this piece. 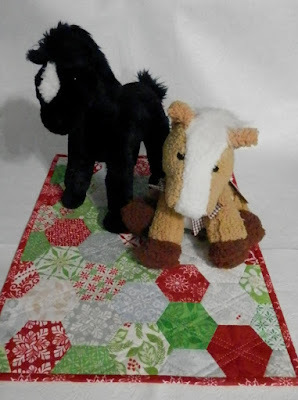 About an hour more to finish the quilting. I've decided to use this as a wall hanging instead of a table mat. You probably thought I had forgotten about those random prize drawings--but I didn't! These tumbling block ornaments are newly-made and a limited edition of 12. This combination of fabrics will not be used again by me--ever. 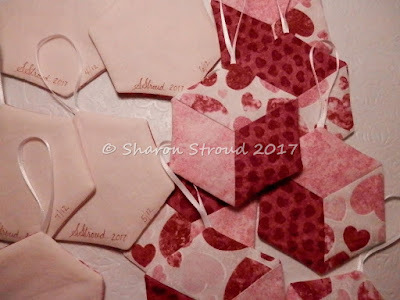 The tops are hand pieced. The tops are layered with batting and a muslin back, machine sewn around the perimeter and then turned and hand stitched closed. Here they are signed, numbered, and ready to go to the winners. Barbara and Kathleen, please email me your snail mail addresses to sharon@sharonstroud dot com. Cindy O, I have your address. And the rest of you I will see over the next week or so--and they will be hand delivered. While you are wishing that you had commented and thus won an ornament, take a look at the placement of fabrics in the ornaments. It's the light/medium/dark that makes them look 3D. Thank you to everyone who takes time to comment--it makes my day! 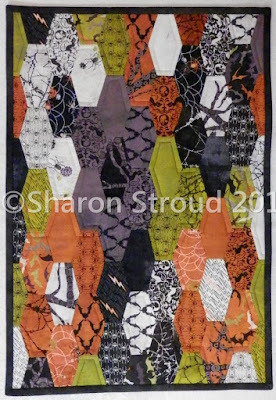 This runner was machine quilted last year (I think in the fall) by Laurie, owner of Longarm Quilting by Laurie, in Elmira Heights, NY. And then it sat while I auditioned binding. I bought three or four pieces of varying shades of gray (no, not 50!). I tried blues, several blacks. No joy. Until last week, when I finally found the perfect two-tone black. I love it and am so happy to have it on the table in use. 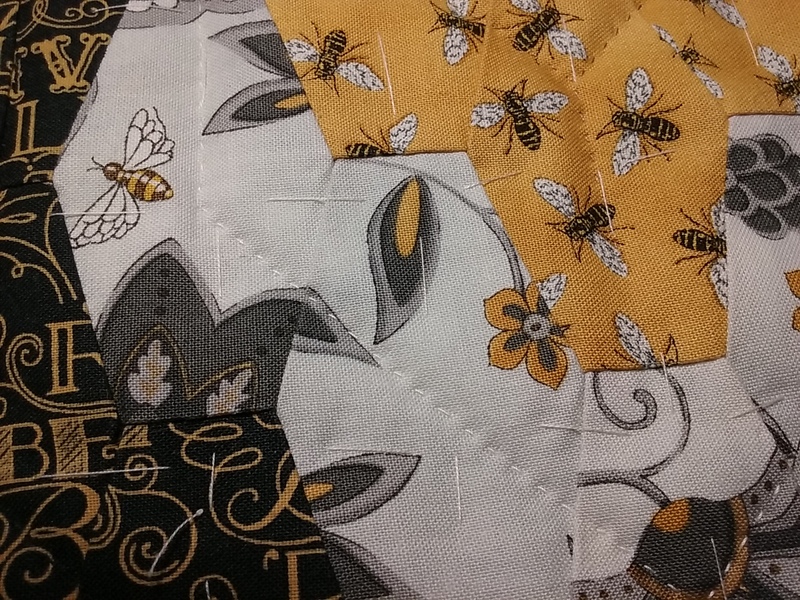 Here's a closer look at the fabric. It's a border stripe, and I used a pattern by Karen Montgomery. 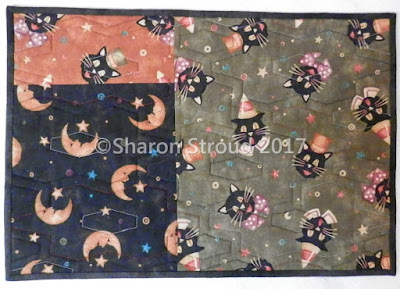 I had told Laurie to quilt whatever she wanted on it--even just a simple meander. I happened to be at her place when she quilted it and, partway through, she asked me what I thought. A slightly wider view of the back. While I didn't join officially, Pomegranate and Chintz is having a challenge to finish 17 UFOs in 2017. Check it out on my blog list at right. The fourth finish is done and will be revealed shortly. This piece just needed the binding and a label at the end of last year. So it has become my second finish of 2017. 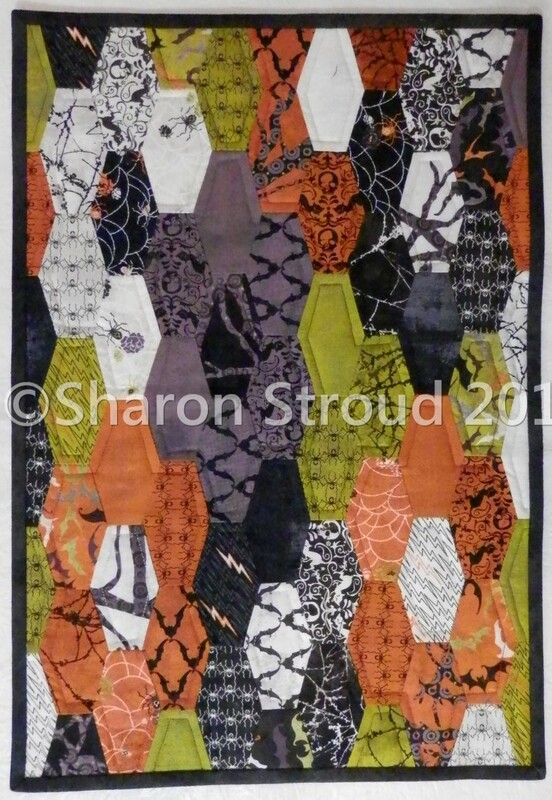 Using 1.5 inch hexagons, this was hand pieced (not EPP) and hand quilted. 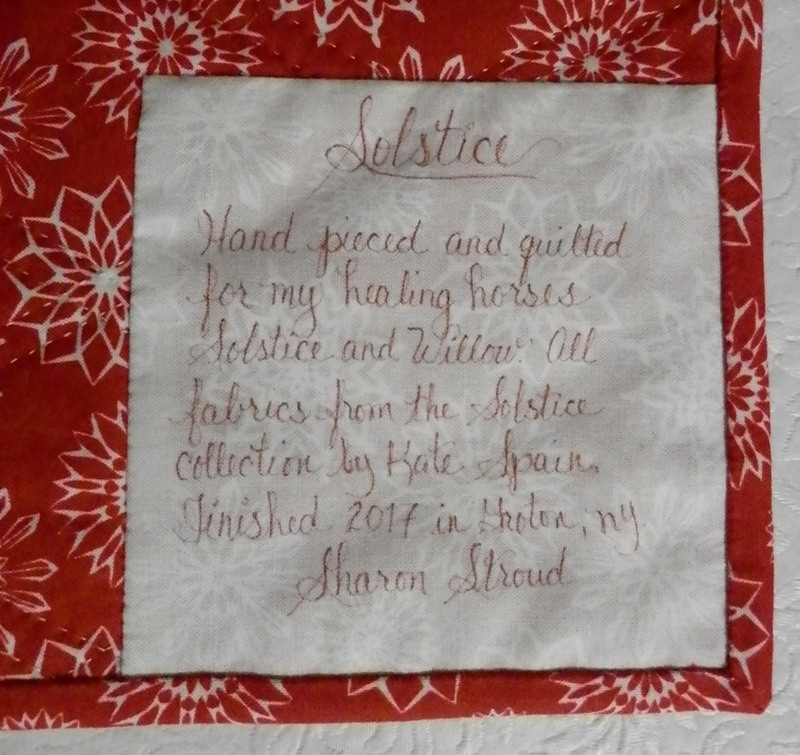 It uses the Solstice line of fabrics from Kate Spain. All the fabric is from that line. The label is actually the last 5" square that I had left from a charm pack. I used the wrong side of it to make the label. In this case, I machine stitched the right and bottom sides of the label in with the binding and hand stitched the other two. Quick and easy. After I posted about my to go bag here, I waited. Why? Because I wanted all of you to have a chance at all the great stuff on Hot 4 Handbags. There were several items I had on my wishlist, but still I waited. Until I couldn't wait any more!!!!! The horse bag you've seen. All the other things came today! 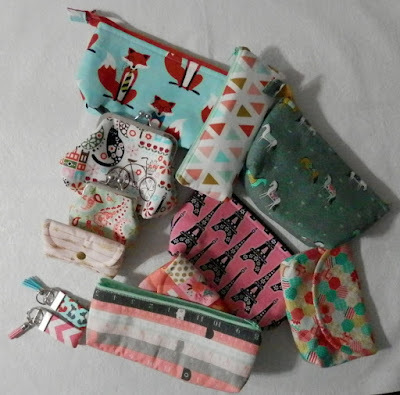 Check these out: Two different sized "pencil" cases, two different sized clasp purses, three snap pouches, two mini fobs, and two more open wide pouches! Here they are opened so that you can see the cool linings. You will see at least some of these in classes. They just make me smile! 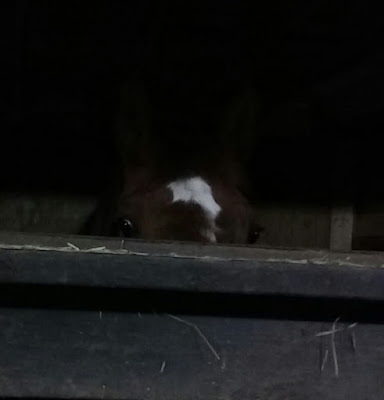 Feeling left out? There are still over 100 things for sale on Denise's Etsy site, Hot4Handbags. I get no endorsement fees from telling you about these great pouches--just the satisfaction of seeing your smiling faces as you acquire your own. 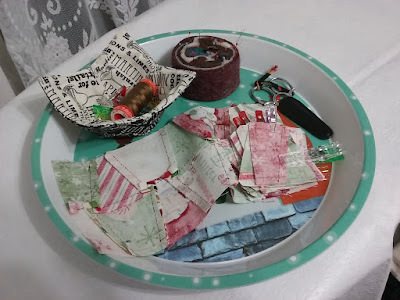 I tend to move from room to room with my hand sewing, so I was looking for something that would serve as transport and then as a worktable. Right after Christmas the grocery store had trays on sale for under $1. Cheap enough to give this idea a try. The rim in deep enough to keep everything in place, but low enough to allow me to work directly from it. I have a fabric dish with/for Wonder Clips, thread, pincushion and pins, needles, scissors and my project. I now have a portable workstation that can go upstairs, downstairs, even outside (but not tonight; too cold to sit on the porch.). Mine is about the size of a dinner plate. I have finished two table runners which I will share over the next couple days. Busy, busy fingers! P.S. I am listening to The Lincoln Myth by Steve Berry. I had forgotten one of the reasons I so like his books--he combines history and fiction, but at the end of the book/CD he explains which parts were real and which were not.